I graduated from Universidad del Desarrollo, in Santiago, Chile. The final step to graduate and to acquire my graphic designer professional title, was to present and approve my thesis. The only requirement for the thesis was that it had to be related to a social cause. In Chile you see disabled people every day, that's why I chose to do something that could help them. After 6 months of research and investigating the handicapped background and statistics in Chile, I found out that 45% of the disabled population in Chile had physical disabilities. From this group, the 70% was unemployed. Also, I discovered that one of the main reasons for people to acquire a physical disability (in Chile) was due to work accidents. People that have to work on the field, with machinery, transportation, and fields like this are the ones that get into more accidents. Thats how I ended up investigating about the mutual securities, the ones that have the obligation, by law, to protect, take care and reintegrate a recently disabled person into a new job. That happens with most of the mutuals in Chile, but I discover this particular one that didn't go by the rules. The patients that were treated in this mutual didn't have the benefit to be reintegrated in a new job. These people had no idea where to go once they got a disability, they don't know how to jump into the world with this new body and features. However, this is something that happens in the whole country. In Chile the information needed for the handicapped people to be reintegrated in a job is hidden, it isn't easy to find it. There are places that integrate handicap people, agencies that teach disabled people how to work according to their capabilities, and companies that are willing to hire disabled people for certain job positions. But the user doesn't know that, because the diffusion of this content is scarse. That's how I got to my project. As a graphic designer my job is to communicate, and here we clearly have a communication problem. After an extended analysis of the user, I conclude that the best tool to use to spread the information disabled people needed to get a job, was through a mobile application. Every person that I interviewed had a cellphone, even if they had some kind of dissabilitie that involved their hands, they managed well enaugh to use their mobile phone. Also the fact that there's 1,3 cellphones per person in Chile lead me to this conclusion. That's how the idea of Despega was born. "Despega" means "Take Off" in english, this makes allusion to the fact that when someone acquires a disability, that person has to move on, life continues, he or she can't spend the rest of their lives regretting what happened to them. In this whole year, I never met someone who didn't move on despite their disability. The users are adults, parents, husbands, and most of them men. Therefore, when someone acquires a disability they have to take off with their new life, because they have a family to maintain. 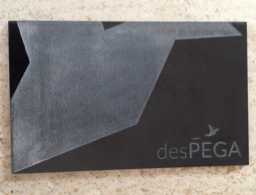 The main characteristic about "Despega" is that creates a profile of the user, collecting their physical features and capabilities, also it connects the user to the best posible job for them, according to their futures. How does it works? Despega it is based in two phases; the rehabilitation process, when the person needs to learn how to live with their disability, and then, when that process is finished, comes the second phase, where the user looks for a job. There are several organizations that are dedicated to help handicapped people to learn how to live and work with their disability. For example, if someone lost a hand, the organizations help that person to learn to do things without a hand, and also they teach the person how to use a prothesis, and how to perform in their possible jobs. The user has a profile on the application, which is synchronized with their process on the organization. This way they can see how they are progressing and be motivated by it. Once they finish their rehabilitation, it is time to jump into the professional world. Meanwhile the user is going through rehabilitation, there are inclusive companies that are seeking to hire them. There are many companies that call themselves inclusive, but when it comes to accessibilities, such as arquitectonical or in terms of inclusive co-workers, they are not so inclusive. This is a know issue among the job seekers that their duty is to find a job for the disabled people. This people are from other organizations that are focused on help disabled people to find a job, and how do they do this? they go to each company and evaluate them. How is "Despega" better than this? Through the application we developed a web filter, the one that makes the best match between the user and the best company for them according to their features and disabilities. How? "Despega" also has a web page, the one that is addressed to the inclusive companies. Through this web page the companies develop a profile, where they fill in all the accessibilities and job positions they have available for the future candidates. On the profile they have to specify, if the company is in a building, in which floor? do they have elevators? ramps? are the co-workers also inclusive? what kind of job do they have available? which tools do they have and for which disability? Among other questions. So, by having the users profile with their features and specified disability, and the company's profile with all the details about the tools, co-workers, and arquitectonical features, we are ready to make the best match possible! Notifications, what makes every user to be constantly conected witht the app. The app informs the user when they have made a progress in rehabilitation, when they have an appointment with a doctor, or when a company wants to contact them. Also to keep the user up to date with all the information they need about the handicapped world, every day they receive a notification giving them a piece of information, or news that are being developed that might be of interest for them. "Teletón, 5km away, 2 professional courses"
Through the app the user can also look for rehabilitation centers, see what courses they offer, the requisites to enter, and its location. But most important of all, they can apply to the rehabilitation center through the app. They can call or either email the organization. Once the user finishes his or hers rehabilitation, this section changes and it shows all the inclusive companies that are best match for them, and they can see everything the company has to offer and contact them through this section, just as they did with the rehabilitation center. Later, if they are accepted or rejected, the app will inform them about this via a notification. There's also a section on the app, where the user can keep track of the organizations and companies he or she has applied to, where they can see where they have applied, been rejected, accepted, and also see their favorite ones. The app also counts with a calendar. As the application is connected with the security mutual, hospital, rehabilitation center and companies, whenever any of this entities makes an appointment it is automatically updated on the users app. The user can also add appointments by himself if he or she feels to do it. The app was tested with real users. After several test with them we finally came up with an application that could be used by everyone, from people missing a finger, to people that have hand prothesis. For my undergrad thesis I discovered that disabled people own an special ID, which, it isn't the best thing I've ever seen to be honest. Also many handicapped people that I interviewed told me that whenever they ask for this ID, the process is long, and it is not taken very seriously. Also a user said "When the ID arrives you spect something of quality, but you just receive a lame piece of paper". This got me thinking, why should this subject be taken so lightly, this group of people deserve a quality ID as well. I created two versions of the credential, one plastic, and the other one on thick paper. After some interviews and testing with the users we realised that the credential weren't as importante as creating a system that would make it easier for them to find a job, that's why we put all our effort and focus on creating a user friendly app that would help disabled people find a jib that matches their qualities and requirements.